This Tofu in Black Bean Sauce recipe is a vegetarian dish that is flavorful, healthy and easy to make. Soft tofu is cooked in a savory and spicy black bean sauce to make a tantalizing dish that is simple yet satisfying. Learn the trick for making tofu silky. This quick method takes just a few minutes but really improves the texture of the tofu, making it soft and buttery. The abundant sauce makes this dish perfect for serving over hot rice. Enjoy a delicious and meat-free meal in now time at all with this easy recipe. I prefer soft tofu for this recipe. 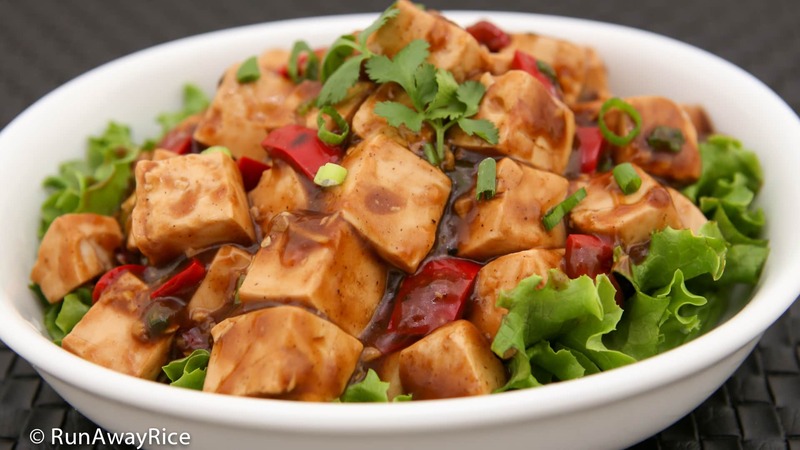 The soft tofu absorbs the black bean sauce quickly, minimizing the cooking time. However, if you’re a fan of firmer tofu, feel free to use. When using firmer tofu, cook for a few minutes longer to allow the tofu to absorb the black bean sauce. Boiling the tofu for 3 minutes makes the tofu silkier and softer. If you’re short on time, you can skip this step. Because the tofu is quite soft, handle gently during cooking so don’t break the cubes. If you’d like the tofu to be more flavorful, cut the tofu into smaller pieces. I am using Fresno red peppers in this recipe. They have a good amount of heat and are spicier than a jalapenos. Use red bell peppers for a non-spicy option. This dish is really versatile and you can add a variety of additional ingredients. For a dish with meat, add ground chicken, turkey or pork. Cook the ground meat fully before adding the sauce and tofu. Optionally, add vegetables such as celery, eggplant, green peppers, mushrooms, etc. 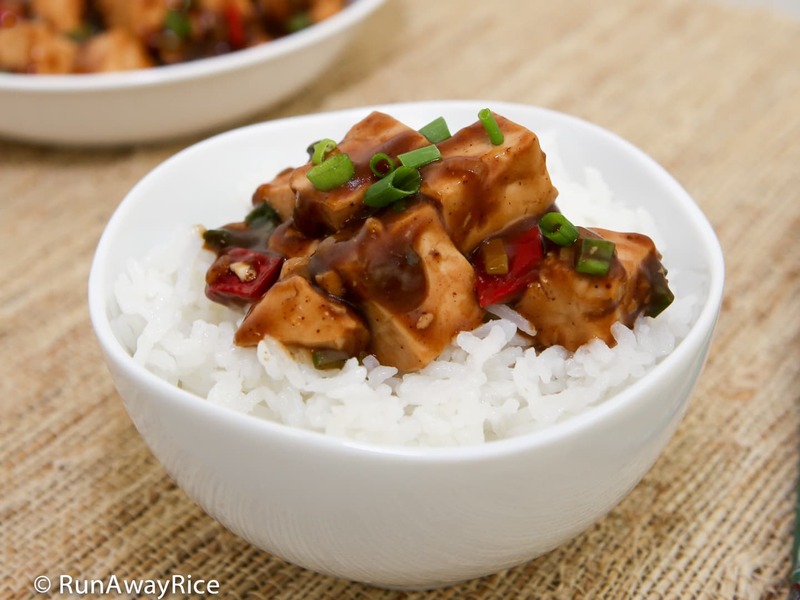 Experiment, find the combination you love and make this Tofu in Black Bean Sauce your go-to recipe! Adjust the amount of sauce to your liking by increasing or decreasing the water. Optionally, use a meat stock or vegetarian stock for more flavor. Also, adjust the thickness of the sauce to your liking. For a thicker, gravy like sauce, use 1 Tbsp corn starch. Cut the tofu block into 1/2 inch thick sections. Cut into cubes, approximately 1/2 inch. In a medium wok, bring water to a boil. Add the tofu cubes and boil gently for 3 minutes. Transfer the tofu to a colander and allow to drain. For the green onions, separate the green stems from the white root. Chop the white root and set aside in a plate. Chop the green stems and set aside as well. For the red chili peppers, cut in half and then remove the seeds. Chop the peppers into small pieces. In a measuring cup, add 1 cup water, the black bean sauce, soy sauce, rice vinegar and honey. Stir the sauce together combining well. In a small bowl combine the remaining 1/4 cup water with the corn starch. Stir together until smooth. Heat a wok over medium High heat and then add vegetable oil. Add the minced garlic, minced ginger, root portion of the green onions, and the red peppers. Stir fry for 1 minute. Add the sauce and bring to a boil over Medium heat. Add the tofu and gently combine with the sauce. Reduce the heat to Low and cook for 5 minutes. Stir occasionally making sure the tofu is coated with the sauce. Stir the corn starch and water mixture and then add. Combine gently and continue cooking for another 2 minutes allowing the sauce to thicken. Turn off the heat. Add half the green onion stems and ground black pepper. To serve, transfer to a large plate. Top with the remaining green onions stems. I prefer using soft tofu for this recipe. The soft tofu absorbs the black bean sauce quickly, minimizing the cooking time. However, if you're a fan of firmer tofu, feel free to use. 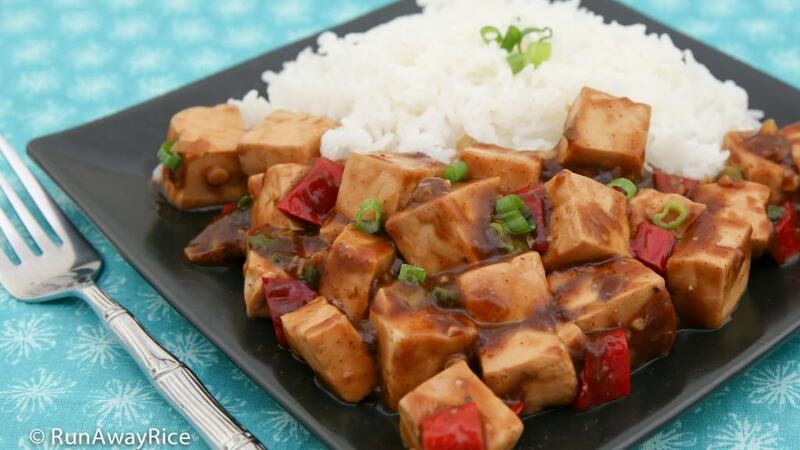 When using firmer tofu, cook for a few minutes longer to allow the tofu to absorb the black bean sauce. Boiling the tofu for 3 minutes makes the tofu silkier and softer. If you're short on time, you can skip this step. Because the tofu is quite soft, handle gently during cooking so don't break the cubes. If you'd like the tofu to be more flavorful, cut the tofu into smaller pieces. This dish is really versatile and you can add a variety of additional ingredients. For a dish with meat, add ground chicken, turkey or pork. Cook the ground meat fully before adding the sauce and tofu. Optionally, add vegetables such as celery, eggplant, green peppers, mushrooms, etc. 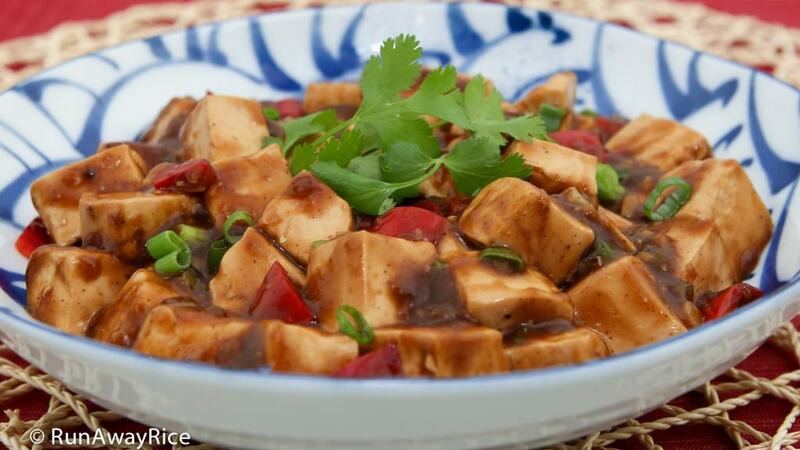 Experiment, find the combination you love and make this Tofu in Black Bean Sauce your go-to recipe! Thank you Chi for the recipe. I will try this recipe next week. I hope you enjoy the recipe Anh! I love tofu, but would this work with your seitan recipe? Seitan would work great in this recipe. Pan-fry the seitan first and then add when the tofu is added. Enjoy!